Looking to improve the consistency of your product and overall system accuracy? Single source responsibility. A completely integrated user-friendly system using off-the-shelf components improves the consistency of the product and overall system efficiency. Melfi Extrude© is the next generation PAC/PLC-based automated extrusion controllers. The system is designed to integrate all discrete components onto the PLC chassis for more reliable operation. Moving all the control operation onto the touchscreen allows the installation of redundant monitors to operate the extrusion line from multiple locations (at the extruder, at the feeder mezzanine, from the operator control room and/or remotely via VPN connection). The Melfi Extrude© PAC/PLC controller has been developed around the Rockwell ControlLogix and CompactLogix hardware platforms using standard RSLogix5000 programming software with Rockwell Automation FTview HMI. We have created a cost effective solution using non-proprietary hardware to simplify the extrusion control process. 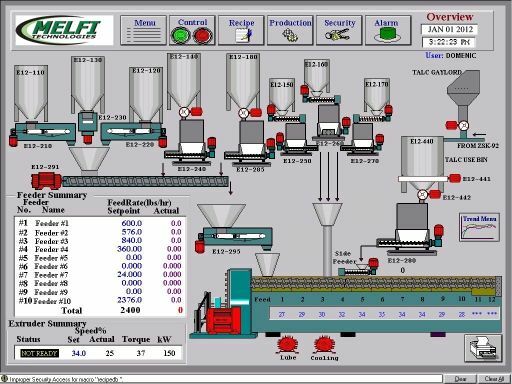 The Melfi Feed© gravimetric feeder control system is seamlessly integrated into the Melfi Extrude© PAC/PLC with no proprietary microprocessor controls to communicate with or maintain. We can directly replace the proprietary feeder control equipment supplied by any of the popular LIW feeder manufacturers. The only solution that controls the entire process from the same Rockwell PAC/PLC processor. The Melfi Batch© recipe control system can be seamlessly integrated into the Melfi Extrude© PAC/PLC to automatically formulate, on demand, all Master batch ingredients to reduce operator error and prevent missing materials from the final product. Allows interlocking of all critical equipment. Replace the clipboard for extruder setup, feeder setup and process data reporting. Interoperability: control, process monitoring, communications, information collection, client/server based recipe and reporting all within one completely integrated and scalable compounding line solution.